Boo hoo, Club Penguin's Captain Rockhopper and his ship will be leaving us today. Are you glad, sad, mad? Did you get to see him? Sail away! I THINK just maybe since everything has been coming out early we just MIGHT see that new Puffle game TODAY! Here is a sneak peek at a couple of the levels in Puffle Rescue! AWESOME! What do you think? Is it possible? Probable? Be on the look out! Let me know if you see it today! Like to draw? Try Shidonni NOW! I totally agree with you Mimo. Everything is coming out early from catologs, parties, and Rockhopper's arrival. I'm going to play it! yay!!!! mimo i havve noticed that most updates happen at 7:00am pst cuz i was waitin around n i was by the clock and it was 7:10am pst and i went to gift shop and it was out and the same with the puffle party!! 7:00am pst not for sure but it might just make it!! in my last comment i put 7:00am pst i think its 7:00pm sorry but its normally that time!! This is the link of some penguins and I anticipating the game. We are wearing hard hats and digging. I am the one who started it and is shouting "THATS THE SPIRIT! DIG!" in the picture. My username is Chinarulesfe. Mimo, PLEASE forgive me for not modding. Lightning hit my house and fried the router. New game! Hi Mimo,ik a glitch.on the home page when Rockhopper is here and move your mouse to the crows nest then Yarr pops out + they should get rid off that glitch because Yarr is missing and......................OMG OMG GMO GMO MOG MGO Yarrs ON THE CROWS NEST!! ( BEEP ) ( BEEP ) Sorry mimo no more ( BEEP ) i said ( Beep ) agin. Aww whats the point. Hey Mimo! 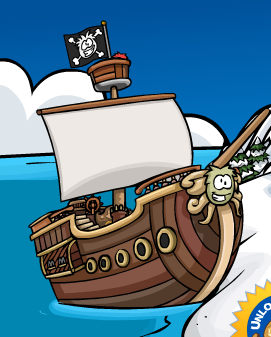 Whats weird is that, why would Rockhopper leave today if Yarr hasnt been rescued yet? Rockhopper is also usually here for the Easter Egg hunt, right? And also is there going to be a St. Patrick's Day party, i thought there was always one? that's kinda what i thought would happen. Maybe not too easy though! Yeah! You are right!! Let us hope that it comes out early! I know! I think it's very possible. I hope so too! Teal Tear, nice name. I'm sure he forgives you, as long as you weren't hurt. Good Observation! Is that another clue for us? i no so the game is coming out today but lator. Totally! I think it may come out in a few hours! Okay... I think.. this comment is kind of confusing to read.. but yeah.. Yarr is on the Crow's Nest, and um yeah. Please do not use too many caps though... Thanks.. um.. Yeah. You make a good point. Will Yarr show up soon? Is there even going to be a St. Patrick's Day Party? Will Rockhopper show for the Egg Hunt? We will see! ...Yeah, that is really weird! Mimo should give you credit! looks COOL i hope it comes out today!!!!!! And I think its going to be a little hard.. Who knows? Is yarr on top of the ship? I think it's coming @ 10 am PST on Monday! (6 pm UK Time). Rockhopper found Yarr. That's why he's there. Keep commenting and modding everybody! Yea i agree. the sneak peek looks awesome! omg! thegreen puffle at the nightclub on the speaker is back! yarr has been found he was found at the mine.cp dident explain it verywell in the cp times but he was found! Oh well it will be a chanllenge I guess? Oh no, I'm so sorry. Hope u/ur house are ok.
poor yarr... rockhopper has to leave yarr when he goes. dude, it said so in the penguin times. and right now sensei is going to do the easter egg hunt. and there may not be a st patricks day party this year because of the penguin play awards and they cant do it next month can they? ohhh... that's not good. I'm sure Mimo will forgive you! You know, I actually don't understand this whole thing. I met rockhopper, and we found Yarr in the mine. THEN Club Penguin says we need to rescue Yarr in the new game.. THEN they say Rockhopper leaves today, but the game comes tomorrow! Do that means Rockhopper leaves without yarr!? But I thought we found Yarr! But we need to rescue him! But he's in Rockhopper's ship! I honestly don't get it. I'm not sure if it is really a glitch or not! The St.Patricks day party will come!! There's no way they would leave out something like that. They'll probably give us more info in next week's newspaper. Most of the time. and yes it will probably come today. Rockhopper's treasure hunt gets you rich quick so that is why we don't have it on the island. i wish we had it to stay. Dude49491's reply: Actually yarr WAS found xD! Don't you ever read the Club penguin times newspaper? If you roll over rh's ship on thew homepage yarr come sout and look around! Cool! I NEEDZ TO PLAY THIS!!!! or ill make Mr.T punch you. Mimo why won't you approve my comment? .....dont want to be mean but im not sure wiehter to beleive that or not. It could happen but it just dosent seem likely. If it did happen, I hope you and your family are ok! Well, im pretty sure Yarr has been rescued. Did you see that the puffles are back? Also, im sure Club Penguin is going to suprise us with a St. Patricks party. There is new furniture related to it! Who knows what will happen(LOLz, only CP) We'll have to wait and see! Probably, lets hope so! Im sure Club Penguin will release it today. They are realasing alot of things early! They have been doing that alot recently. Hey, I dont mean for this to offened you or be mean but when you said "Dont you ever read the Club Penguin times newspaper?" It was mean in some ways. Some people could take it a differnet way and it could hurt there feelings. And you dont need to put "CLUB PENGUIN GANG MOD" after your name, just put "CPG MOD" it means the smae thing only shorter! Hey is it possible that if u stay on rh's ship when he leaves he'll take you to his island? Mimo.. I modded 9 comments today.. and one later.. and you only posted the one i modded later... Did the others not go through? HEY!!!! DON'T BE MEAN!!!! (Pardon my caps!) That was NOT NICE, and you won't become a mod if you continue to break rules! Cut out the attitude!! Home Sick so i will see it all before my sis! i, for the first, got to see rockhopper! It was awesome! I don't know about you, but this game looks like a game i used to have on my computer called jacks escape or something. i used to play that game for hours. You would have to find shoes to go on certain surfaces so you can get te key which unlock doors. those were the days. Maybe your comment didn't follow the rules. uh mimo, i think your sight might be glitched. sometimes the comment number will change and there werent comments added. Strange right? Im not sure if its happenging to other ppl but it does it 2 me. danny1221 said... I NEEDZ TO PLAY THIS GAME!!! or ill make Mr.T punch you. ~~~~~~~~~~~~~~~~~~~~~~~~~~~ i modded myself for the first time !!!! horay! the first ever self mod. i deserve a cookie. ___________________________________OK, I said the first thing about Yarr, and yes I DO read the cp paper, but i miss read it. And yeah, don't be so mean. I no right??!! !if it does nt happen, i will miss st pattys day! !i loved the parade!! It is likely! My aunt's house got hit, and so did both of my grandmothers'! That is a tragic thing, and it is certaintly, VERY likely!! its weird when rockhopper comes he always gives the same bacround if u meet him. Only on really special occasions he brings new ones like the adventure party. So if u meet him once u met him every time basicaly. MIMO! AT 7:18 EST THE PUFFLE SHOP WAS HAVING RENOVATIONS AND WAS A WHITE BLANK PLACE!IT WAS SO COOL IT WAS ON MATTERHORN SERVER AND WE HAD A PARTY! OMG!!! Maybe Rockhopper's Puffle Yarr Is Trapped Inside The Cave???!!! Mimo what about the Saint Patricks day party? I have not heard one thing about it and Saint Patricks day is on Wednesday! Also I hope we can bring our puffles to help us play. Oh, I'm very anxious with the new game! MIIMMOOOO ! the green puffle is BACK at the Disco ! Mimo, I dont see alot of the mods who are on the list modding. It's as if they dissapeared. Hmmmm, idk. so it wouldn't matter if yarr is there. remember they're very suprising in cp. well, since everything comes out early, maybe this comes late? Nope. I dont think this comes early or this comes late. This comes at the current Club Penguin update times. So this one is on time right now. look in the picture... can u see yar? today is 15 in singapore and at clubpenguin.com they still have the migrator at the homepage! But for some reason Yarr is still gonna be on the island when rockhopper leaves. How is rockhopper going to get Yarr back? The puffle saving game is late and Rockhopper has stayed! hey mimo, go to ski village and into the loudge room and click on the wagger pin ,it and say yes, it says it is not avaialbe. Yeah, it's alright but i normally plan what im doing so it's not clashing with something coming out (sad, i know) but now it's a bit random its harder to predict. Well, technically times are different for everybody during updates. Like for me, they update at 9:00 PM, but for most people it's 12:00 AM. Me too! Are you thinking puzzle game or action game? No, he isn't, although if you mouse over the crow's nest of the ship on the Club Penguin he pops out. That's just because, although many people have complained, CP is probably too lazy to change it! Oh come on Club Penguin, how hard can it possibly be to delete that mouse-over?! You just delete some code (I think)! I know!! It's weird, since we haven't RESCUED him yet! Also, the yellow puffle is back at the stage, and we haven't rescued HIM either!! Actually, the tone of Dude49491's reply was mean. That wasn't a 'normal' question, it's called a retorical question, which means a question which doesn't need an answer, and it's commonly used in arguments, where everyone's tone is angry and aggresive (especially in parliament). Also, the Penguin Times did not say ANYTHING about Rockhopper finding Yarr. It only said that Rockhopper wanted to thank everyone for finding out WHERE Yarr was. Yes, I've noticed that! It's very useful isn't it? Sorry, I left out part of my answer. Although you could try it, and if you do get to Rockhopper Island then sorry that this post is inaccurate. Um...mimo...if you can see the date...THE PUFFLE GAME IS NOT OUT YET!!! So unfair they haven't posted it yet. its March 15th here, and the new game is not there!!! :0 whats happening?! This looks like we will have to compete against ourselves in the new game! The new game still is not out. the new game isn't out yet!!!! its gonna be late!!!!! Not kidding. The weather has been FREAKY where I live lately. I am by a river, and in the fall it flooded! Uuuuuuuuugh. I was just on CP and the game is still not out yet, and its even 7:00 am cp standard time! (not in my time, though) darn. at least i can wait all day cuz im sick :) o well. il be waiting! Pozro said... Wouldn't it be fun for us if we save one black puffle,than we could get that puffle free! That would be so awesome! (CPG Mod) Keep On Waddling! I noticed that also! What's going on? Huh, the game looks a lot like Frogger Adventures for the Gameboy Advance! Btw Mimo, on the Spy Phone, the Ice Rink is still called the Pitch. That would be cool, Pozro! Then my brother would be able to get puffles since he isn't a member! I'm sick too so I can wait all day and don't put (CPG Mod) when you aren't modding. i dont like it how the game is gonna come out later today coz it sed its gonna come out today but its not. Sorry to hear that you're sick! It hasn't came out yet? Ughhhhhhh! I have spring break this week, so I will be home all day, too. Boo hoo WE WANT THE GAME! woooooo the game looks so good but what about yarr? did rockhopper find him is he leaving without? i think i may go crazy!! Its like its the 1st of january thing!! THAT HAPPEND 2 DAYS LATE!!!!! I dont get it were is the new game because i went on ClubPenguin in the mine today and the game was not there. Whats going on? Did Rockhopper find Yarr? We don't want Rockhopper to leave without his puffle Yarr!? I dont get it i went on ClubPenguin earlier today and the NEW game in the mine you still CAN'T play. Am confused and Rockhopper did not leave yet, go on ClubPenguin and look. When is the new game coming out it's supposed to be today. Whats going on? Club Penguin doesnt update in the morning. but Yes it is slowly updating. Lol, I'm sick today too! Well the rockhopper ship is on the main Club Penguin page, but he's not docked at the beach when you log in! It might be fixed soon bt what ever..
weird if you notice the picture of rockhoppers ship and look in the crowns nest yarr is in there! We didnt even have to rescue him! Poor Yarr, being left by Rockhopper!